"When war broke out in 1939 I was 15 years old. 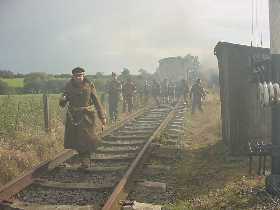 I was working at the LMS, that was the London Midland Scottish Railway, and I volunteered for the LDV, which stood for Local Defence Volunteers, later known as the Home Guard. LDV for us stood for Look, Duck and Vanish. We were attached to the Northampton Regiment and known as the Church and Chapel Brampton Home Guard on the Spencer Estate at Althorp. 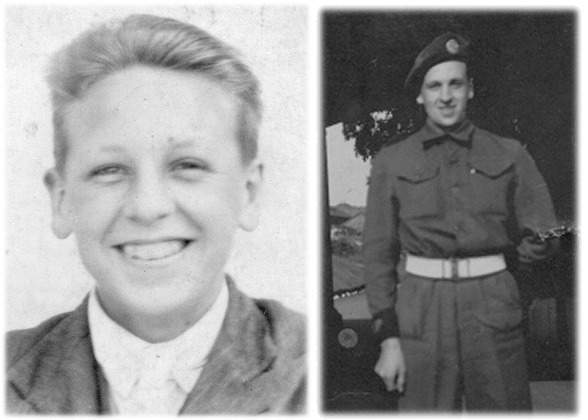 I spent 2 years in the Home Guard and then went into the army...."
Mr Bandy is pictured here as a cheerful young man in 1937 and again in 1943/44 as a Lance Corporal in the Northamptonshire Regiment after his Home Guard service. Serving with Mr. Bandy was his father George Bandy, b. 1877 (and pictured left), a Boer War veteran who had been in the 6th Dragoon Guards between 1896 and 1908. His uncle James had served in India for 12 years with the Somerset Light Infantry 1892-1904. Ancestors and relatives included a casualty at Balaklava, a survivor of the Indian Mutiny, G.H. Bandy KIA during the Great War and C.S.M. Bandy, D.C.M. who survived it, both with the Northamptons. Around the time of Mr. Bandy's joining the Home Guard, his elder brother Jim of the Grenadier Guards (pictured right in 1940) had been wounded at Dunkirk and later his nephew, another Grenadier, was taken prisoner in Italy. 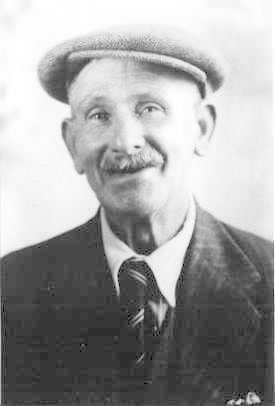 The end of hostilities in 1945 did not however discourage the family: three nephews served in the Malayan Emergency at the same time, again with the Northamptons, another was with the Glosters in Korea and Mr. Bandy's own son served in Northern Ireland, Iraq, Afghanistan and the Balkans. We are indebted to Mr. Bandy's son, Capt. 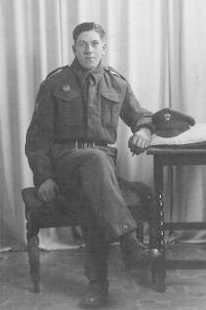 Graham Bandy of the Queen Alexandra's Royal Army Nursing Corps and late of the 2nd Bn. Royal Anglian Regiment, for the above information about the Bandy family; and also for the comment that Chapel Brampton station, part of the Northampton and Lamport Railway, is annually the scene of a Home Guard re-enactment during its 1940s weekend. One of these events is shown on the right. Details of the local Living History Unit which undertakes these re-enactments can be seen here.